Mt Rainier is located around 55 miles southeast of Seattle in the state of Washington in America. It is 4,392 meters high and is considered as one of the most dangerous volcanoes in the world. 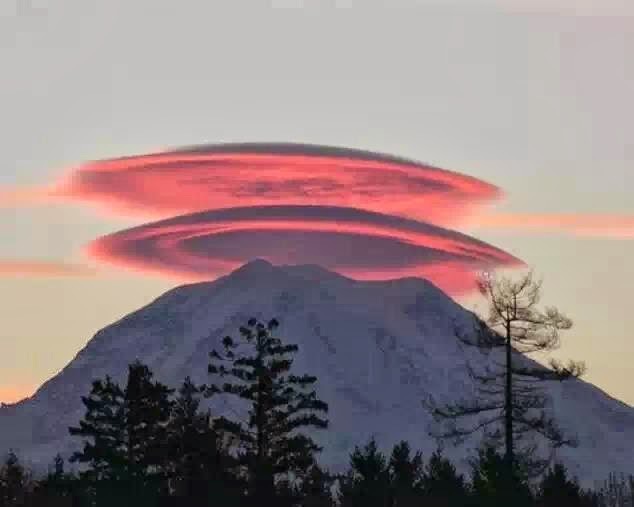 Lenticular clouds are formed when the temperature at the crest of the wave falls to the dew point. Due to stable moist air flowing over the mountain, numbers of large scale standing waves may form on the downward side. They are rarely formed so the people who get the oppurtunity to capture it in camera are lucky to experience such mystery and divine beauty of nature. Beauty of nature is simply divine..